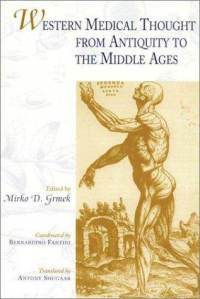 A landmark work, this history of medical thought from antiquity through the Middle Ages reconstructs the slow transformations and sudden changes in theory and practice that marked the birth and early development of Western medicine. Editor Mirko Grmek and his contributors adopt a synthetic, cross-disciplinary approach that conveys a complete and varied vision of our medical past, with attention to cultural, social, and economic forces as they have affected the historical flow of knowledge and the practice of medicine. The various chapters by an international group of scholars, isolate key ideas behind the history of medicine in the West: charity and aid for the sick; medical scholasticism; the concept of disease; intervention with surgery or drugs; and the regimen of health. Throughout, they highlight the links between socioeconomics in general, with a focus on the physician, and the scientific ideas, beliefs, and techniques behind prevailing medical practices. The result is a multifaceted history, unparalleled in its scope, of the myriad influences on the development of medical thought, and of the impact of that thought on other branches of knowledge and on human behavior across the centuries. Mirko D. Grmek is Director of Studies at the École Practique des Hautes Études, Sorbonne, Paris. He is the author of History of AIDS: The Emergence and Origin of a Modern Pandemic.